How do you ensure you’re always in the perfect light? Create your own with BECCA’s brilliant limited edition complexion-enhancing palette. Featuring the brand’s new Sheer Glow Filter Powder in four flawless finishes (Brighten, Blur, Contour and Blush) this sumptuous selection acts like a real-life photographic filter, minimising imperfections and evening out skin tone for a soft, natural-looking finish. Blurring, defining and illuminating, each powder blurs and blends effortlessly so that you can find your best light in no time. Ensure you’re always viewed in the best light with BECCA’s Be A Light Face Palette, an effortless, all-over complexion-enhancing palette, featuring the brand’s new Sheer Glow Filter Powder in four flawless finishes. Each shade uses varying levels of pearl and colour to blur, define and illuminate for a perfected, natural-looking glow. Beautifully blendable, the powders offer sheer coverage and a hint of light, letting your build and customise your own lit-from-within look. In the ‘Light to Medium’ palette, there’s a soft pearl ‘Brighten’ powder, a flattering beige ‘Blur’ powder, a neutral tan ‘Contour’ powder and a light pink marbled with silver ‘Blush’ powder to add a pop of colour and light. In the ‘Medium to Deep’ option, there’s a neutral peach ‘Brighten’ powder, a warm sand ‘Blur’ powder, a warm bronze ‘Contour’ powder and a warm copper marbled with rose gold pearl ‘Blush’ powder. Use the ‘Brighten’ tone to boost radiance, the ‘Blur’ shade to even out the complexion, the ‘Contour’ shade to sculpt and define features and, finally, the ‘Blush’ hue to add subtle, uplifting colour. Step 1: Brighten Powder (left shade): Use all over the face to brighten & boost radiance. Step 2: Blur Powder (right shade): Use all over the face to blur imperfections and even the complexion. Step 3: Contour (bottom shade): Use to sculpt and define features. Step 4: Blush (top shade): Use on cheekbones to add a pop of colour and light. Talc, Caprylic/Capric Triglyceride, Dimethicone, Octyldodecyl Stearoyl Stearate, Zea Mays (Corn) Starch, Diisostearyl Malate, Polysorbate 20, Sorbitan Stearate, Isostearyl Neopentanoate, Magnesium Aluminum Silicate, Nylon-12, Aluminum Starch Octenylsuccinate, Isopropyl Palmitate, Sodium Hyaluronate, Simmondsia Chinensis (Jojoba) Seed Oil, Ethylhexyl Methoxycinnamate, Tin Oxide, Synthetic Fluorphlogopite, Calcium Aluminum Borosilicate, Silica, Tocopheryl Acetate, Phenoxyethanol, Sodium Dehydroacetate, [+/- Mica, Titanium Dioxide (CI 77891), Iron Oxides (CI 77491), Iron Oxides (CI 77492), Iron Oxides (CI 77499), Red 7 (CI 15850)] <ILN45376>. Mixed feelings about this palette! Brighten powder does nothing in my opinion! The blur powder, although it’s nice and leaves my makeup looking great, it falls out ridiculously, can’t use the powder without it making a mess!! Probably won’t buy again as I feel for the money, could find something better. The blush and the bronzer are amazing however the highlight is non existent and the blurring powder is useless. I am disappointed for the first time of Becca. I won’t recommend this palette. I have tanned olive skin and this palette just makes me look orange. Even the brightening powder sets orange on my skin and the powder clings to fine lines. I can't see any benefit in this palette. It was a complete waste of money. The powders are poor in pigments, especially the blush. The orange tone is ugly and the blurring powder doesn't work at all! The lighter shade has no use as it isn't matte and it doesn't give opacity either.......Terrible and useless purchase! Received this morning and couldn’t wait to try it out, everything about this pallet is amazing (especially if you don’t want that ‘caked’ makeup look), it really does make you look glowing!, the only downside to this pallet is that the contour isn't as pigmented as I would usually like and struggle to build up to how I like it, but that’s a personal problem not a problem with the pallet!! Would 100% recommend to anyone! The brightening powder gives a soft natural glow finish, I'm enjoying it as a setting powder. The blur powder is surprisingly dark for my fair skin, I now use it as a finishing powder for foundations that are slightly too light for me (it's not super blurring but it definitely gives an almost airbrushed look on my skin). The blush is stunning, it's so beautiful and glowy - blends really nice and makes me look healthy. The contour blends really nice and isn't too pigmented (which I love). I really like this palette overall, it really does give you a soft glow finish, it's not for people who are looking for overdone glow because you will get a naturally healthy finish with this palette. The pigmentation just isn’t there for any of these powders, they might as well all be translucent with the way they show up on my skin. Really wish I could get my money back on this, it’s sooo not worth it. Well worth the money. The blur powder makes you have a flawless, airbrushed finish. The brightening power is finely milled as well. Beautiful product that surpassed expectations. I am absolutely blown away by this palette. The brightening power is the best for the under an eye and the blur powder makes your make up look airbrushed. I couldn't believe it. I want to buy another one so I don’t run out. Thank you Becca!!!!! Yes honey! Complète pour le teint! Ce que j'aime le plus c'est le bronzer qui convient parfaitement aux peaux médium mates comme la mienne. Texture, tenue et odeur nickel. Merci Becca! *** Yes honey ! Perfect for complexion! What I like the most is the bronzer that perfectly suits medium/tan skin tones like mine. The texture, wear and smell are perfect. Thank you Becca ! At the beginning I did not like this face palette, but after some uses I got the hang of it. I love it and it comes with me when I travel. I am in LOVE! First of all, I have to say that I am not a huge fan of highlighters in general since I have combination skin (more on the oily side actually) I don’t like any of that sparkly, glittery shiny stuff on my face. Moreover, most highlighters out there are rather loud and not suitable for the everyday office makeup look (if you ask me). That might also be the reason some of you are disappointed in the product and blame it on the pigmentation of the product. 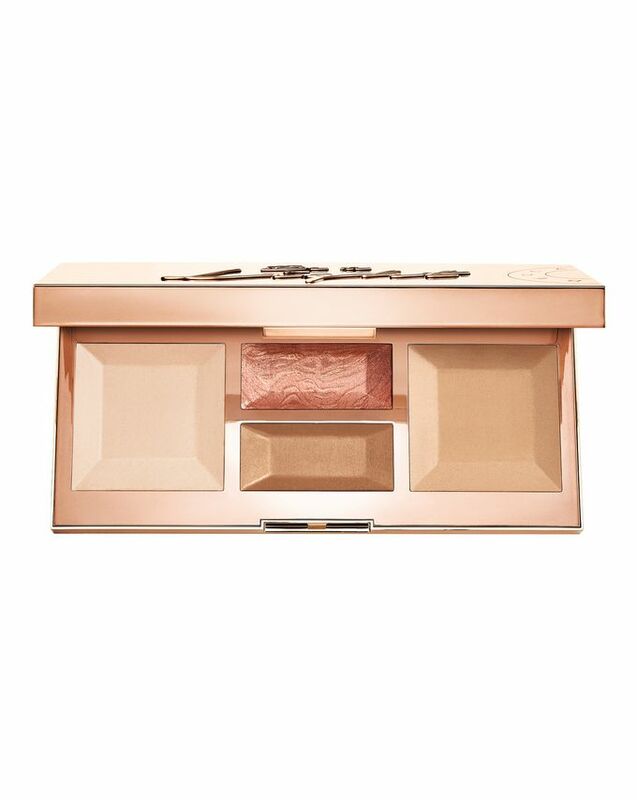 This palette…OMG I adore the way my skin looks like after I used it. It absolutely does what it claims to do. 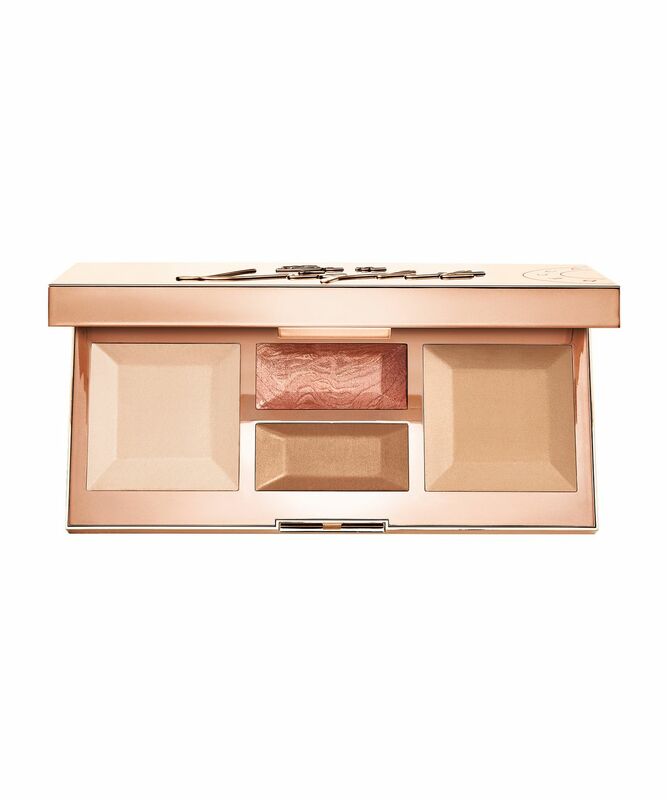 Brightens, Blurs, Contours and Highlights the face leaving you with the perfect post-holiday glow. I have been using it every single day since my purchase. A huge recommendation for anybody looking for an everyday palette all-in-one palette. I am amazed at how flawless I looked after using this. The blurring powder really blurred out my pores and gives me a flawless finish. The bronzer and blusher are buttery and gives me a nice contour and blush, very beautiful. The highlight is subtle not as bright as Huda Beauty and Anastasia Beverly Hills but gives you a nice natural highlight on the cheekbones. I really love Becca products, and this one is no exception. The best colour is the blush, it’s so beautiful. I hope they will bring this one in a bigger single pan soon. I use the brightening powder as an all over powder and the blur powder as a bronzer/contour. I have a fair skin tone. The pigmentation and consistency of this product are awful. The two larger shades and contour shades are very powdery. They swatched very streaky and took a lot of pressure to get any pigmentation (especially the brightening shade). They barely do anything on the face. The only ok shade is the blush. Maybe I got a product from a bad batch. But I am so disappointed with this product. The only redemption is the pretty package. £35 down the drain!!!! Amazing palette, real pigment. Need a minimum product for a nice and subtle bronzed look. Perfect!